‘Player Profile’ is the name that we’ve stuck to player analysis pieces that feature up and coming youngsters playing for Munster. Munster added the then 18 year old Fineen Wycherley to their academy books over the Summer and it really hasn’t taken long for the Corkman to make his mark in the first team. 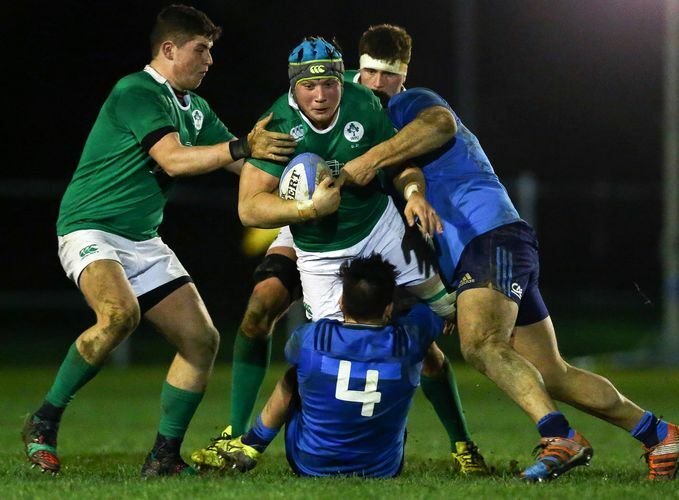 Born in Bantry, Wycherley followed his grandfather’s footsteps aged 17 when he moved to Roscrea’s Cistercian College with the intention of maximizing his rugby potential. 2 years on, and he now has caps for the Ireland U20s and Munster – fair to say that particular choice has paid off. Wycherley is a more than capable defender and ball carrier, but his work at the breakdown is most definitely his showpiece. The first aspect of his rucking going under the microscope is his support play. Above, Wycherley is seen binding onto the carrier seconds before contact, helping Ireland to crash over the gainline with intent. The Young Munster clubman is ferocious in going about his business and this is a prime example. As soon as the Irish ball carrier is tackled, Wycherley releases his teammate, identifies a threat to the ball in a flash and drives the Scottish defender well beyond the ball. Not only is this technically excellent in aiding Ireland’s cause in retaining possession but it also sends out a brutish message to the opposition as the counter ruck is denied before the defender can think twice. Quite similar circumstances here. Wycherley binds onto his man and drives through the tackler before wrestling him to deck. His ferocity is stamped all over his actions here and it helps Ireland get dominant front foot ball. Perhaps premature on this point, but Munster have badly lacked instant clear-outs in this season’s Champions Cup and Fineen could just be the man to fix that problem. It may be longer-term, but with Kleyn out and only the under-performing duo of Dave Foley and Darren O’Shea standing in his way of a spot on the bench for Toulouse, who knows? Moving on to more standard clear-outs, and we see Wycherley being even more of an animal when he has a bit of a run-up. In the GIF above, Ireland look in a spot of bother as three Scotsmen surround the Irish ball-carrier. However, Cillian Gallagher (#5), buys some time for his side by obstructing the poachers, but not yet clearing them out. That will be his second-row partner’s job. Wycherley adjusts himself at an angle so that he can come through the ‘gate’ and duly smash the Scottish defender before he can pull off an ‘Italy‘ at the fringe of the tackle area. If Wycherley had been any bit later to the scene, there may have been trouble for Ireland as the Scots chose not to compete at the breakdown, but by quickly hitting the number 12 the referee had no time to interpret Wycherley’s actions as a tackle off the ball, rather than a clear out. As a result, Scotland have to quickly scrap their idea and retreat for the next phase. Just one advantage of having a rapid clean. Just one advantage of having Fineen Wycherley in your team. Looking further into Fineen’s rucking, he didn’t spend too much time on the field of play for Munster at the weekend but still denied a potential turnover in the build up to Rory Scannell’s all important drop-goal. He shows some versatility in his cleans here by knocking the Cardiff Blues’ counter-rucker off the ball with a croc-roll manoeuvre. And the turnover game is strong. Whenever close to the tackle area in defence, Wycherley tends to take an instinctive look for a jackling opportunity and his judgement is on the money on the above occasion. Almost simultaneous with the Scottish attacker hitting the deck, Fineen gets his hands around the ball. Once players get into poaching positions, they usually close their eyes and hope for the ref’s whistle before the clear-out arrives. However, when exceptionally positioned, you can afford to relish the opposition’s contact as the shove-on usually means you are simply being helped in presenting the ball back on your side. Wycherley’s stance suggests he should be in the same state of mind. 6’5 in height yet arched with his shoulders below his back-side and both feet planted far apart at the bottom of tree trunk legs…fancy stopping him? This guy is a massive prospect for Munster. Rassie Erasmus has shown how highly he rates Wycherley by giving him his debut just about two months after his 19th birthday and I think he has every reason to hold him in high regard. …and Fineen Wycherley strikes me as that man. Whenever Wycherley’s time comes, it will be to the great benefit of Munster Rugby. His skill-set will probably expand through the years but right now he already has the perfect character traits to make it as a starting forward with his province. Maybe still a little raw, but the potential here is outstanding. Fineen Wycherley, good luck with everything from all at Munster Haka.